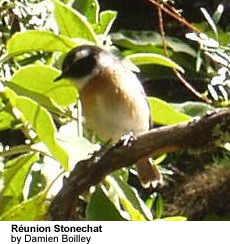 The Reunion Stonechats (Saxicola tectes) are small perching birds found on Réunion island in the Indian Ocean, east of Madagascar. They are common in clearings and open mountain bushlands. This species has white eyebrows which differentiate it from the otherwise similar African Stonechat whose eyebrow's color is black.